The Daring Bakers: Stollen ~ I Can Do That! 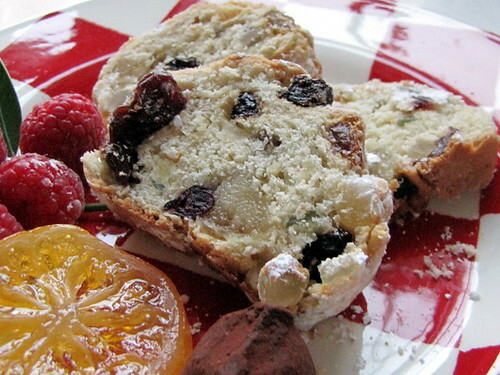 Stollen is one of the regular Christmas goodies that we have in our house year after year for more than 20 years. This is the second year I have not bought them from the store since discovering homebaked is much much better. For this challenge, we were given a choice of shaping it into a wreath. I baked a small batch of stollen a few days before the challenge was announced and they have been shaped into the usual rectangular cakes. I wanted to try this recipe and the wreath shape so I baked just half of the recipe. To view the complete recipe and instructions click here. A few changes I made: I used 2 tablespoons of sugar instead of half a cup, omitted the cinnamon and orange and lemon extracts, used almond flour instead of flaked, and added 1 more cup of dried fruits and candied peels. These are the fruits I used: golden and dark raisins, dried cranberries, dried tart cherries, and candied citron, lemon, and orange peels. I also used vanilla infused powdered sugar for the coating because I love the extra vanilla flavor. The fruit cake is very yummy and I can't wait for it to age for 1 week which is how I like stollen. And I always leave some slices on the kitchen counter for weeks until they are very very dry and crunchy, sort of like biscotti without baking them a second time. The crunchy stollen slices are very good for dunking on my morning coffee. These are the ones I made November 29, 2010 and last year both using Peter Reinhart's recipe from The Bread Baker's Apprentice. Beautiful stollen! 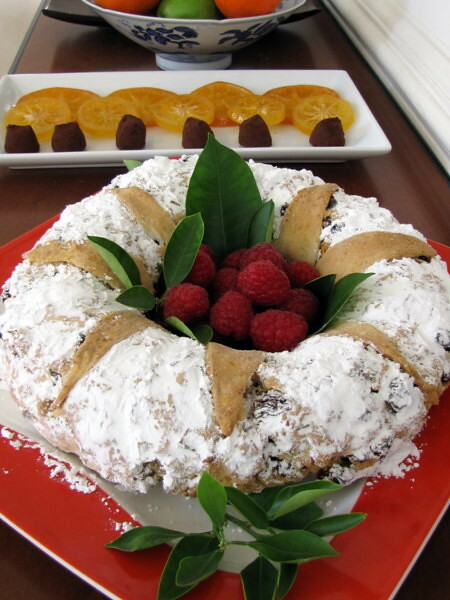 How funny that you just made your Christmas stollen right before the challenge was announced, but the one you made for the challenge in the wreath shape turned out beautifully - I love the decorative presentation and your photos are great. Great job and Happy Holidays!! Omg Stunning pictures.. everypicture and the texture, wreath everything looks great. Merry Christmas !!! Your stollen are perfect looking. Love the decoration of the wreath. Happy holidays! Your photos are beautiful! 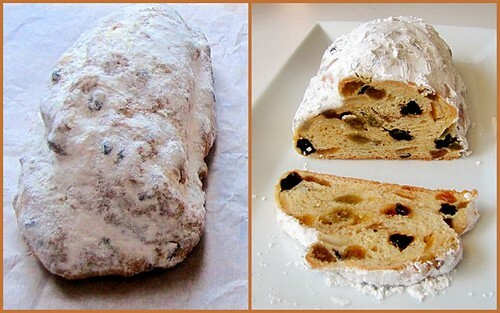 Both stollen look delicious - such beautiful texture. I can't tell you how much I'd love a piece with a cup of tea right now! Your stollen is beautiful! Love the raspberries in the centre. Happy holidays! Very nice decoration for your Stollen. Both the one you just made and that from last year look great. Your stollen are gorgeous looking. Love the decoration of the wreath. Happy holidays! 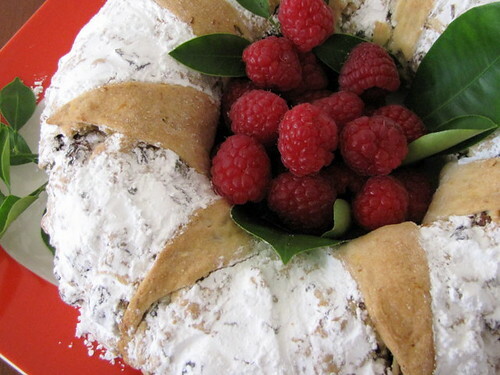 The wreath stollen looks beautiful, as well as all the others! Your stollen looks fantastic! Love all the citrus flavors! 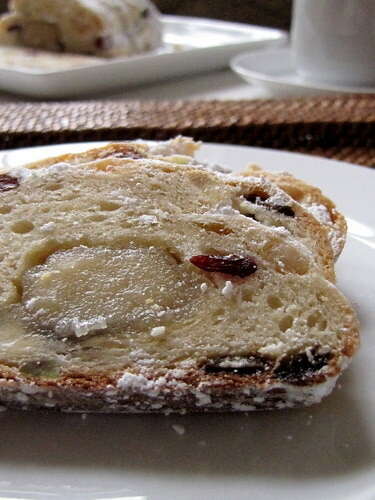 Your stollen looks delicious! Lovely pics as well. I too enjoyed this challenge.